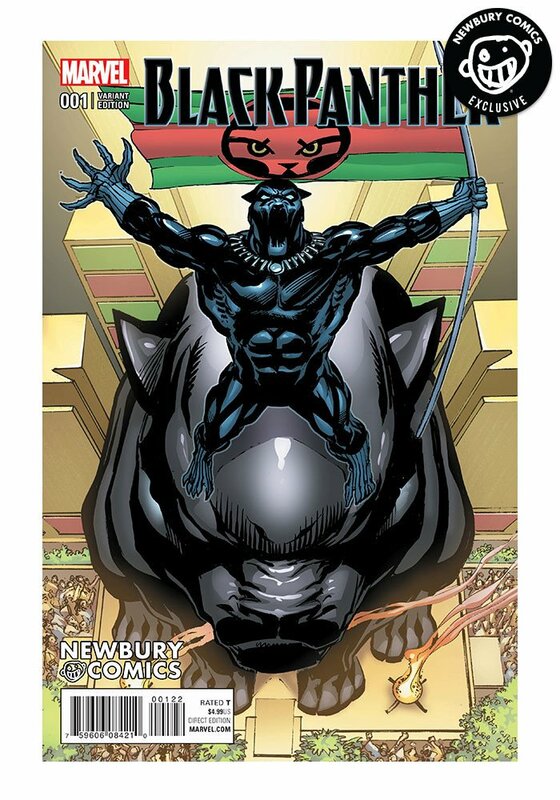 Veteran artist Neal Adams did a Black Panther #1 variant cover for Newbury Comics. The retailer was founded in 1978 in Massachusetts has 28 locations. Like Midtown Comics in New York and the Comic Bug shop in California, Newbury Comics offers exclusive variants of comic books. Adams has a long, distinguished career as a comic book artist. In addition, he is well known for his efforts to gain creator's rights for comic book writers and artists. His cover shows a somewhat top-down view of Black Panther/T'Challa with his arms outstretched as he stands on top of a large statue of a panther. T'Challa's mouth is open in the image as if he's screaming; the teeth make him seem more animal or panther than man. Far below, we can see what are likely the citizens of Wakanda.